For every lawful building a moment comes when, for one reason or another, it has to be abolished - forcibly or voluntarily. Removal may be at the initiative of the municipality when, in connection with the poor condition of the property, it is necessary to protect citizens from risks. But the demolition may also be on the initiative of the owners (physical and / or legal persons) who by removing the old building free space to build a new building or to use the land in another way. 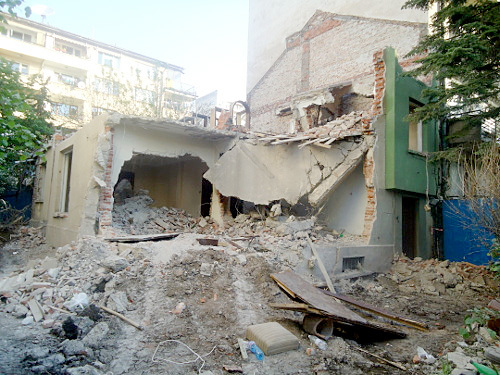 The actual demolition of a real estate hides a number of risks, not only for the owners of the building, which can only be achieved by strictly observing legally regulated procedures. According to Art. 195, para. (6) of the Spatial Development Act, the mayor of the municipality may order a building to be demolished if due to natural wear and tear or other circumstances it has become: dangerous for the health and life of the citizens, unfit for use, threatened with self-immolation, from the occurrence of a fire or is detrimental in sanitary and hygienic terms. Removal is ordered if the building can not be repaired or strengthened. This is done by an order that the mayor may issue after an official inspection of the site or after a signal inspection by interested persons. Upon issuance of the order, the mayor acts in the conditions of operating autonomy - ie. even if an alert has been filed by an interested person, is not obliged, but only empowered (if judged) to issue an order to demolish the building. The decision of the mayor is based on the certification of the building by a special commission appointed by him. For Sofia Municipality the commission is permanently active. This commission reviews the building and the adjoining story and has the duty to hear the owners and stakeholders. The Commission shall draw up a report recording, in addition to the results of the review, the results of the hearing of the persons concerned. The Commission proposes to the mayor what action to take: correction, consolidation or removal - if inevitable. On the basis of the Commission's conclusions as reflected in the minutes, the mayor issues a removal order. The mayor's order also sets a deadline for owners to remove the building for their own account. It is the mayor's order (not the Commission's protocol) that is subject to appeal. The procedure continues with an invitation to owners to voluntarily remove the building. In urgent cases where the immediate danger to the health and life of the citizens is ascertained, the mayor may order the execution of the order in advance. In the case of non-fulfillment of the order by the obliged persons or upon admitted preliminary execution, the construction is removed from the municipality through a company selected after a public procurement. Prior to the demolition of the building in the presence of a representative of the exploitation companies, a statement of its status shall be drawn up. The police shall be notified in advance of the date and time of commencement of the removal and shall be obliged to assist in the refusal of the owner to voluntarily admit the workers to the site. If the building has a total built-up area of ​​more than 100 m2, it is necessary to prepare a Waste Management Plan under Art. 11 of the Waste Management Act. If the property is an object of cultural and historical heritage, permission from the Ministry of Culture is also required. The chief architect of the municipality issues mandatory technical prescriptions for the removal. For the costs of the removal, a record is drawn up, on the basis of which the court shall issue an Order for execution under the procedure of Art. 418 of the Code of Civil Procedure and the Execution Sheet on the basis of which the money is collected by the owner together with the legal interest. For non-fulfillment of the enforced order of the guilty person shall be imposed fines stipulated in the TDA. The detailed conditions for the application of the procedure shall be determined by an ordinance of the respective Municipal Council. It should be noted that this procedure does NOT remove an illegal building, but a lawful building whose condition is dangerous for the public and the surrounding. The removal of illegal constructions is forced by the authorities of the NCSD in different order.